The common perception of Americans is that we don’t enjoy watching films with subtitles, but I have a hard time believing that. It certainly isn’t for lack of ability that Americans don’t pay to see subtitled films in theaters: the United States is in a many-way tie for 20th in global literacy rate (99%). It’s not because we don’t like foreign films or actors, especially when it comes to action films (Jet Li, Jackie Chan, Michelle Yeoh, Tony Jaa, and many others are household names who broke into the American market through subtitled martial arts films). Why do subtitled films get such a bad rap? Are we lazy perhaps, unwilling to read in a medium where sound and movement dominate? Maybe the subtitles are too distracting? The answer to both is “no.” Accessibility, viewing environments, and complex visual displays all provide formats whereby commonplace, everyday manifestations of assistive, reiterative, or supplemental text-on-screen scenarios occur. For instance, think about the following scenarios: watching television at a gym or a bar, watching a safety video on an airplane, the news or stock price “ticker” on a cable news channel. These are all situations where text is a welcome (perhaps tolerated) and distraction free substitute for, or addition to visual and aural components. I’m not arguing that subtitles in a motion picture are exactly the same thing as the scenarios I mentioned, but they are not too far off in some cases. From a communications standpoint, a lot of communication is done with facial expressions, gesticulation, tone of voice, and other elements that are not completely tied to the semantic content of spoken words. In artistic performances, much more communication occurs through camera angles and effects as well as music (sometimes to the point of cliche). If you watch a foreign language film with no subtitles, especially in cultures that are similar to ours, you could probably understand much of what is going on without having a clue what the characters are saying. In fact, you could probably describe the major plot points with a surprising amount of accuracy, adjusting for cultural differences that skew your perception. So what are the subtitles really telling us? That seems to me to be wholly dependent on the genre. Genres such as action films, which enjoy a wide popularity in the U.S. regardless of language, don’t tend to place as much emphasis on dialogue. For instance, you could easily watch Fearless and pick up what’s going on without one lick of dialogue: that particular film relies heavily on hero and redemption archetypes. Crouching Tiger, Hidden Dragon might pose more of a problem. The Girl with the Dragon Tattoo , a journalism and political thriller, would be near indecipherable. In general, I would argue that action films and comedies (at least those that rely on physical comedy or visual irony) require less attention to subtitles than dramas, where much the heavy lifting is done by dialogue. Translating foreign films into an American market used to be a simple process of dubbing in American English dialogue performed by voice actors. Arnold Schwarzenegger and Bruce Lee both famously appeared in dubbed films, even though they both spoke passable English. The problem: lose the original sound track and you get a jarring, dissatisfying mix-up of sound and facial movement (along with low grade, sometimes asynchronous, sound effects). Dubbed English is especially aggravating to cinephiles and genre/story fans who wish to experience a film in it’s “original” format (albeit with some assistive measures like subtitles or light glosses). Hence, it would seem that the best we can do, apart from telepathic translation messages, is to have subtitles. Not so! In the past decade, we have seen numerous remakes of foreign language films, minus the original actors, directors, and in some cases, story line. In their place, American actors, American directors, and Americanized storylines. 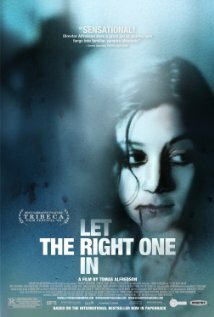 Take for instance Låt den rätte komma in (En: Let the Right One In ) (2008) and its Americanized counterpart, Let Me In (2010). In terms of actors and directors, an Americanized remake where the characters speak English must, by necessity, have English-speaking actors and directors. Without knowing whether the original cast and crew spoke English, it’s safe to say that many of them probably did not speak at an acceptable proficiency level or without a marked accent that would make their speech patters incongruous with an otherwise American film. Hence, they are all dropped. Storylines are a different beast entirely. If the true goal of remaking a foreign film were to eliminate subtitles, then the film would be a shot-by-shot remake with English speaking actors: an “Englishization” as it were. That is not the case with this film, or with other comparable horror film remakes for that matter (e.g. The Ring or The Grudge which remake Ringu and Ju-On , respectively). Instead, the stories are rewritten for American settings and around American expectations of story. Controversial or disturbing elements, such as the castration of the “girl” in Let the Right One In , are frequently dropped (to appease the MPAA rating board I assume). Plots are reorganized into a linear trajectory, subplots are dropped, and characters are merged to make composites (as often happens when novels or graphic novels are converted into screenplays). The goal then, when remaking foreign films, is not solely to avoid subtitles, but to make a film that major label studios believe will be more palatable to American audiences. If the true goal of remaking a foreign film were to eliminate subtitles, then the film would be a shot-by-shot remake with English speaking actors: an “Englishization” as it were. This results in thematic problems which compromise the vision of the original film. In Let the Right One In , the ambiance of the film is one of isolation from culture and society, such that a boy finds a brutal vampire to be a superior companion to his classmates. The palpable solitude of the scenes and cultural void that the boy lives in is magnified, I believe, by a foreign viewer missing the cultural cues that soften the profound sense of strangeness for a native-language viewer–a case where being a foreign viewer adds to the experience. The tone of Let Me In totally reverses that, with cultural elements such as Mrs. Pacman, Now and Later candy, and “I’m Burning for You” playing on a radio all serving to soften the atmosphere of strangeness for viewers. With the relief of pop culture making the story more relatable for the viewer, a totally different aesthetic exits. Does this mimic the original experience of the native-language viewer when watching the “original” film, or rob the foreign-language viewer of the unique experience of watching a foreign film with foreign cultural elements? Frankly, cultural elements don’t translate on a one-to-one scale, and you can’t remake something exactly as it was. The question then becomes are you remaking something, or just copying it? I was told (and feel free to blast me if I have this wrong) that Harry Potter novels have British idioms and British English spellings edited into comparable American idioms and American English spellings for versions sold in the U.S. Does this significantly detract from the story? Who’s to say really, since language is such a specific part of culture–you can’t have a perfect translation from one language to another without losing something, tangible or intangible. Can you translate a film from culture to culture the same way you translate a language? More likely, when you Americanize a film you lose something important: the chance to learn and experience, however imperfectly, another culture through arguably the best and most relevant teaching device–aesthetics.